Knifeman who reportedly shouted "Allah" stabs three people at Victoria Station before being arrested. 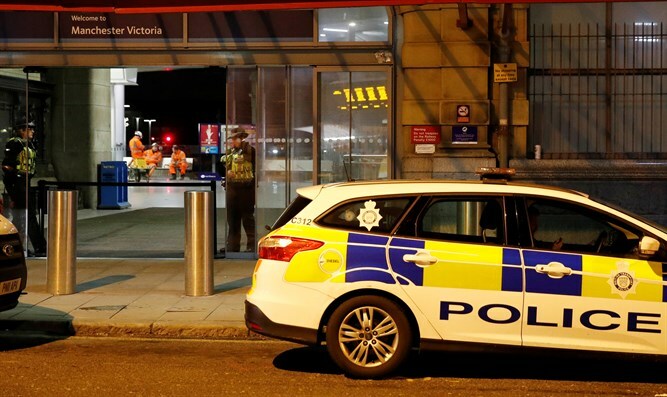 A knifeman who reportedly shouted “Allah” stabbed three people in at the Victoria Station in Manchester on Monday evening before being arrested. At least three people were stabbed in the attack at the city center transport hub, according to The Daily Mail, including one British Transport Police officer and two members of the public who are currently receiving treatment in hospital. The attacker was said to have been armed with a long kitchen knife and was pepper sprayed and tasered before being arrested by police officers. British counter-terrorism police are investigating the stabbing, according to Reuters. Police said, however, there was no intelligence suggesting a wider threat. BBC journalist Sam Clack who came within touching distance of the attacker, said he heard the man shout “Allah” as he carried out the attack. “It was pretty scary. It was just me on the platform and as I was standing there I heard the most blood-curdling scream I had ever heard from a woman nearby,” Clack recalled later. “It looked like there was a fight going on. I heard the guy starting 'Allah' distinctly. I didn't hear the rest of the sentence,” he added. Monday’s attack took place not far from the site of the 2017 suicide bombing at the Manchester Arena, in which 22 people were killed and 59 wounded. Britain has been targeted by several terrorist attacks in recent years. In June of 2017, three terrorists drove into passengers with a van on the London Bridge, then proceeded to stab people at the nearby Borough Market, where they were eliminated by security forces. In April of that year, a terrorist was arrested near Parliament before he was able to carry out an attack. Earlier this year, a 29-year-old British citizen originally from Sudan rammed his car into several people before crashing outside Britain's Parliament, injuring three.